Hyundai will reveal an updated version of its i10 city car at the Paris Motor Show 2016 on 1 - 16 October. The mid-life updates include improved in-car connectivity for smartphones and refreshed exterior styling. The i10 also gets more safety kit. Hyundai hasn't confirmed the pricing for the updated i10, but has said it is aiming to keep as close as possible to the current model's sub-£8000 price tag. The face-lifted model will go on sale in January 2017 and should reach showrooms by the spring. Hyundai claims to have improved the ride and handling, with new 14-inch wheels and larger front bump stoppers and modified steering gear ratios, which should soften the ride and improve steering response. The engine line-up remains unchanged, with the 1.0-litre petrol offered alongside the more powerful 1.25 unit, with both mated to a five-speed manual or four-speed automatic gearbox. The 1.0 unit will return an official 60.1mpg, while the 1.2 petrol will provide up to 57.6mpg. Inside the i10 gets improved smartphone connectivity, with a new seven-inch touchscreen system incorporating Bluetooth, Apple CarPlay and Android Auto. Hyundai navigation also gets a seven-year subscription to live services as standard, with traffic reports, weather forecasts and safety camera locations updated automatically. The interior dimensions of the car remain unchanged, which means the i10 will carry four adults in comfort, while the wide opening doors will make access easy for those in the front and back. As before, the boot will provide up to 252 litres of storage. The exterior gets some light changes, with a new grille and revised LED daytime running lights, which are now positioned above the bumper. The rear of the car gets black inlays, round fog lamps and reshaped bumper housing. 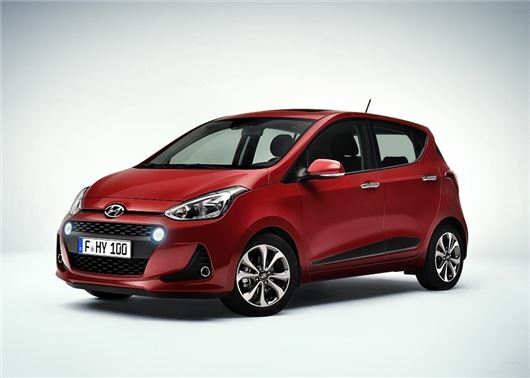 As with all vehicles in the Hyundai line-up, the updated i10 will be covered by a five year unlimited mileage warranty, along with five year roadside cover as standard.